Special Issue "The 4th Industrial Revolution from Open Innovation in Manufacturing and Service Industry to Cyber-Physics"
A special issue of Journal of Open Innovation: Technology, Market, and Complexity (ISSN 2199-8531). With the exception of the nine keynote speech papers, papers which were selected at JOItmC to form a Special Issue of SOItmC 2018 will be recommended for the Best Paper Award of SOItmC 2018. Submitted manuscripts should not have been published previously, nor be under consideration for publication elsewhere (except conference proceedings papers). All manuscripts are thoroughly refereed through a single-blind peer-review process. A guide for authors and other relevant information for submission of manuscripts is available on the Instructions for Authors page. 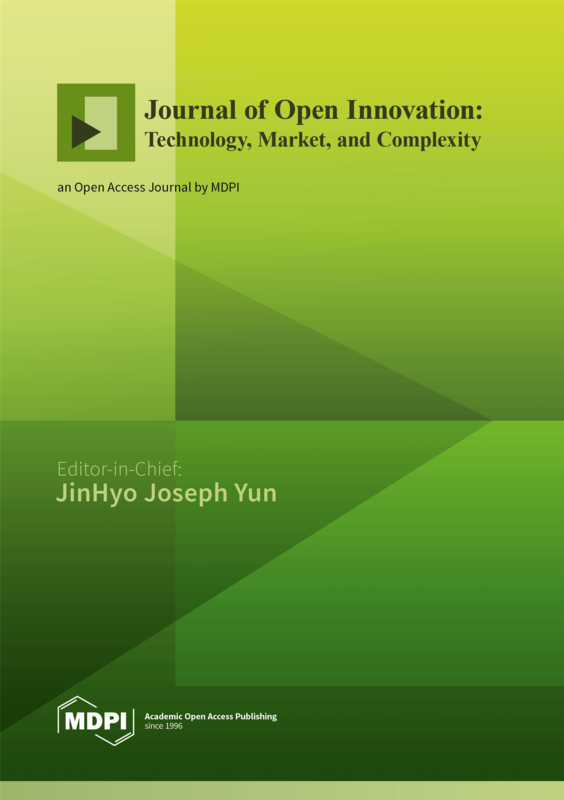 Journal of Open Innovation: Technology, Market, and Complexity is an international peer-reviewed open access quarterly journal published by MDPI. In Korea, cooperation between university and company is mainly encouraged by government policy as the Triple Helix’s statist model. Since 2003, the government started a variety of university financial support program, and in 2014, it reached to the point that 31 ministries conducted [...] Read more. Essential oil and aromatherapy industry is increasingly gaining prominence in the global market. Previous studies have been carried out on the benefits of essential oils in healthcare and as part of the healing arts of many cultures, as a proven method of caring [...] Read more. This study estimates the impact of potential climate change, and human interference (anthropogenic deforestation), on temperate forest carbon pool change in the capital area of South Korea, using a dynamic global vegetation model (DGVM). Additionally, the characteristics of forest carbon pool change were [...] Read more. Innovation policy and business strategy often expect that investing in private and public research and development will immediately produce a flow of products and processes with high commercial and social returns. Policymakers and managers implicitly follow the logic underlying most linear innovation models [...] Read more. The development of the financial sector has been a major growth driver in all economies, especially in emerging economies. Part of the financial innovations in the sector in recent times is the electronic payment system. Several studies in developed countries have substantiated the [...] Read more. This research addresses a specific issue in the field of operation scheduling. Even though there are lots of researches on the field of planning and scheduling, a specific scheduling problem is introduced here. We focus on the operation scheduling requirements that the Fourth [...] Read more. Purpose: As the development of high technology, information and communications technology (ICT) and e-government has pursued improving efficiency, productivity, democracy, responsiveness and transparency in government, the demand for efficient government administration systems and government transparency has increased. Thus, this study aims to derive [...] Read more. Precision medicine has received a lot of attention in recent years and we have not yet found any research cases that apply Data Envelopment Analysis (DEA) to investment decision making in this area. The purpose of this study is to analyze the relative [...] Read more. The new logics of competitions are mostly based on exploiting relationships to implement new mechanisms in managing Knowledge. Today, a successful company should be, lean, modular, and with a smart approach to new products development. In this context, the source of competitive advantage [...] Read more. Humans now have a life expectancy of nearly 90 years and, as a result, society is rapidly aging. These longer life spans have, however, increased the average length of hospitalization for elderly adults suffering from chronic diseases such as cancer, diabetes, and encephalopathy. [...] Read more. Nowadays, the way of Internet travel in China presents diversified development. Rapid expansion in the personal mobile terminal and Internet infrastructure for the Internet travels to the ecosystem of development and evolution. This paper explores the influence of the expansion of the e-hailing [...] Read more. The pharmaceutical industry, where research and development (R&D) efficiency is central to company survival, has recently faced significant challenges. To increase efficiency, companies must implement strategies such as open innovation (OI), wherein they sell their intellectual property, maximize their use of external resources, [...] Read more. Recently, concepts and principles from the Complexity Theory (or, generally speaking, the complexity sciences) have been applied as a perspective for capturing the influence of the context, interaction, and adaption in the innovation processes, such as the ones enabled in the business incubators. [...] Read more. Compared to information technology (IT) revolutions, which are characterized by disruptive innovations, the innovations required for the 4th Industrial Revolution will be characterized by the cumulativeness of the innovations. Therefore, we will need new modes of technological learning and new strategic concepts. The [...] Read more. This research aimed to build a solid basis through analytic hierarchy process (AHP) analysis to develop a reliable and practical valuation model that reflects the characteristics of the biotech industry and propose a reference formula to estimate the license fee by drug class [...] Read more. (1) Background: As we enter the experience economy, industrial design has focused on social innovation and has flowed into social design. This fresh design perspective has been employed in citizen-centered-policymaking through empathic approaches that emphasize the necessity of public service design. Focusing on [...] Read more. The aim of this paper is to investigate the entrepreneurial intention of Italian female students according to the Ajzen’s Theory of Planned Behaviour (TPB). In particular, we analysed the women’s intention to become entrepreneurs because the relevance of the female entrepreneurship phenomenon is [...] Read more. This paper proposes a research agenda for understanding how to establish and develop strategic partnerships with universities in innovation ecosystems, aimed to support the development of companies’ entrepreneurial and innovation development capacities. In particular, the paper suggests an integrated model to explore how [...] Read more. The purpose of this study is to suggest efficiency improvement using the analysis of the efficiency of the royalty system for government-funded research institutes (GRIs) belonging to the National Research Council of Science & Technology (NST). Twenty three GRIs’ royalty incomes and expenses [...] Read more. Since Klaus Schwab and the World Economic Forum declared the arrival of the Fourth Industrial Revolution, there has been much discussion about it. However, there is no commonly agreed-upon definition of the Fourth Industrial Revolution. Therefore, we attempted to answer the following four [...] Read more. Although new product development and its importance for companies as a new approach is accompanied by risks, identification of competitive advantage factors can be helpful for managers in reduction of decision-making risks. The Toos Nirro technical firm is a leading company in meeting [...] Read more. Unlike national systems of innovation, a knowledge-based economy is grounded in the volatility of discursive knowledge enabling us to specify expectations. Expectations can be improved by testing them against observations. Furthermore, expectations can be codified in different ways; for example, in terms of [...] Read more. The paper focuses on the topic of the relationship between coopetition and innovation as well as on their impact on competitive advantage. Before getting to the central issue, a literature review on the topic of coopetition is carried out, in order to catch [...] Read more. The purpose of this study is to verify the effectiveness of the entrepreneurship curriculum and the educational program recognized by students and graduates. This paper has studied the improvement of curriculum and educational programs operated by the Graduate School of Entrepreneurship by using [...] Read more.